Location: Buckland Abbey, Buckland Abbey, Yelverton, Devon, PL20 6EY, Yelverton, . Find us in the great Barn under the gorgeous Christmas Tree. 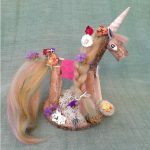 We’ll have our beautiful range of fantastic kits available to buy for presents or make your own at our little workshop. Please note unfortunately we will only be able to take cash payments for kits and workshops as no card facilities available at this venue.